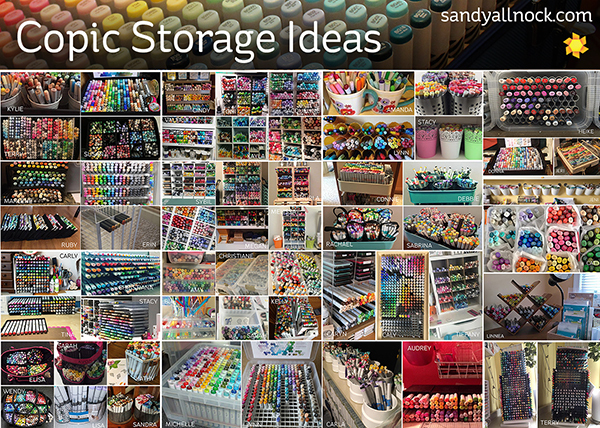 I’m no storage expert – but I am a little of a hub for Copic colorists, so I asked on Facebook for YOUR ideas to store your markers. You came through in spades, thank you all! In the video below, I show you the cases and inserts I have here in the studio, then walk you through some categories of storage, and end with the most unique ideas I saw. I didn’t have the ability to use EVERY photo – but I sure appreciated them all! Scroll down for lots more info, and enjoy the video below or click HERE to see it in HD on YouTube. Links mentioned in the video….No affiliate links are used in this post. Below are all the photos so you can get more of a peek. If you want more information on where the person got their storage shelves, cups, bins, or inserts, please feel free to find them on THIS THREAD on Facebook. Please do not friend them without asking first – it will be most helpful to all of us if you ask your question publicly in a comment under their photo….then we can all read the responses. Pin away…..
Friday at 7am Pacific time, I’ll send out the first lesson link via email. Note that if you click and it’s slow, or not very responsive, it might just be everyone rushing in at once – try coming back later, but please don’t refresh over and over and over – the host site might think you’re a hacker and block you. Just be patient. NOTHING is “live” at 7am in the “live broadcast” sense. You can watch it anytime you want – the word “live” means I’ll spend as much time as I humanly can getting questions answered. That’ll last throughout the “live” class – til a few days after the final lesson is delivered. Lessons will be delivered every OTHER day by email. Ten in all. So much learning! If you’re viewing on a smart device, you MAY need to click the TEXT link for the videos. Some of you have had issues with videos appearing as black boxes or getting some kind of privacy message; the text link should bypass whatever’s going on. IF traffic slows or crashes my site, then the next lessons will be sent at 7am YOUR local time. That’ll spread the load a bit so not everyone is joining in at once. For anyone signing up after midnight this THURSDAY (the night before class), the full price ($34.99) will be in effect. ALSO – folks signing up past midnight on May 26 will receive their pre-class email along with links to any of the lessons that have gone public by the time they sign up. That means they can watch several lessons in a row and still be part of the Q&A in comments. Great video, looking forward to more class lessons. Thrilled to see my storage included. I’ve gone through several and this is my favorite. Sandy – are the Copics supposed to be stored horizontally when not in use? I always assumed so given that is how I see them stored in the store and because they have 2 usable ends. I’m working on finding the perfect storage that works for me, and before I go any further in my search, I want to know your thoughts. Must they be stored horizontally? Or is vertical OK? That is SO good to know! THANK YOU!!! Really enjoyed your classes this weekend in Buffalo! Can’t wait to get into my studio this weekend and play! Do you have any thoughts on storage of Zig Markers? Vertical? Brush up or down? DELIGHTFUL VIDEO!!!!! Thanks so much for sharing! I am thrilled with my storage for Copics – but it did cost me $150.! Some of these ideas are genius!!!!! No wonder there’s a Copic marker shortage… hahaha! Great ideas – thanks for posting. I’ve been wrestling with how to store my set and this saves me some effort. Thank you! I enjoyed this very much! I don’t own any Copics but I love organizing solutions so this is right up my alley. Great post and video! Thank you! Great vid! I find that what’s almost as interesting as the different ways of storing Copic markers, is the wonderfully different color arrangements we papercrafters have used! I liked your Hex Chart organization tremendously, by the way!!! If I had the space and the case, that’s definitely how I’d do it! Thanks for sharing. I like seeing new storage ideas. I’m not a marker person. Pencils are my coloring medium of choice. But I love seeing how everyone stores their toys. Thanks for sharing these images & info. So excited to start the class! I loved seeing all the great storage ideas as well. Thanks so much for all your hard work to bring this class to us!